Ucom suggests starting the academic year with an excellent smartphone and a lot of internet. Till September 30th new and existing subscribers of Prepaid, and postpaid Universal or Universal Plus services, who will acquire the latest Xiaomi Redmi 6A 4G smartphone released in 2018, will get 20 GB internet bundle for 6 months, without any commitment. «Anyone buying any smartphone from Ucom will get the mobile internet bundle of 20 GB. 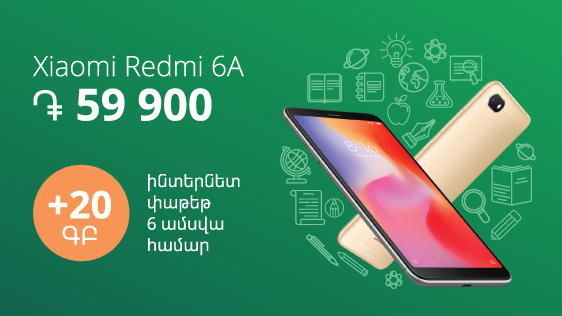 We offer not only to test Armenia’s fastest 4G+ mobile network capabilities, but also immortalize the unforgettable moments with a quality video camera, read books and follow the world news on a really big screen”, said the Co-Founder and Director General at Ucom Hayk Yesayan. Let us note, that the newest Xiaomi Redmi 6A smartphone has main 13 megapixel camera and 5 megapixel frontal one, the screen size is 5.45”, and the battery is durable. The smartphones can be purchased both in cash and on credit, starting from 0% of advance payment, 0% annual interest rate and 0% service fee. Let us add, that a 1-year official warranty, as well as additional 1-year free post-warranty service is provided for all the smartphones sold within this offer, provided that the smartphone has been purchased from Ucom online shop.